Jessica Chen Weiss, Cornell professor of government, speaks on campus during The Great Crackdown: A Roundtable on Censorship and Protest in China Today. We are committed to supporting faculty who are leading the design of new approaches to foster global learning and collaboration. 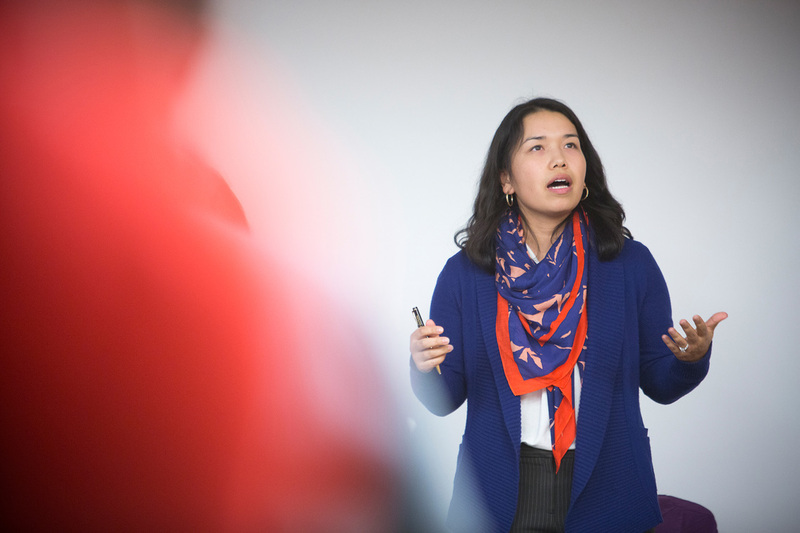 Global Cornell recognizes that financial incentives are essential in engaging faculty in international activities and internationalizing the curriculum on campus. Centralized funding opportunities help faculty implement innovations to internationalize the student experience, and encourage their development of new multidisciplinary global partnerships for teaching and research. The Cornell China Center has announced new Grants for Innovation in China. Eight interdisciplinary, collaborative teams received awards for their plans to develop innovative research projects with far-reaching impact in and for China. Research teams include two or more Cornell faculty from different departments and engaged collaborators in China. Projects focus on long-term research goals and intended impact, demonstrating a high potential either to attract continuous funding beyond the grant period or to help the center broker more resources for the research on the topics. International Faculty Fellowships are awarded to faculty on the basis of their internationally focused research, teaching, and scholarly achievements. Fellows are nominated by the deans of their respective college/school and chosen for three-year terms by a faculty committee chaired by vice provost for international affairs and director of the Mario Einaudi Center for International Studies. Currently, 10 international faculty fellows are supported through Global Cornell, each for a three-year term. The Office of the Vice Provost for International Affairs awards Internationalizing the Cornell Curriculum (ICC) grants to support innovative faculty-led initiatives that will expand opportunities, on Cornell's Ithaca campus and abroad, for high-impact global learning experiences for Cornell students. The 2018 Internationalizing the Cornell Curriculum grants were announced on April 9. Nine faculty-led projects received 2018 ICC grants, totaling approximately $155,000. 2018 marks the fourth year of the program. To date, 56 awards have been made to support international curriculum development projects. 2017 ICC grants totaling nearly $171,000 were awarded to 10 faculty projects that incorporate global-at-home learning into the Cornell curriculum. In FY2016, the second year of the ICC program, $213,086 was awarded in course development grants to 25 faculty members from 6 colleges and units. The 2016 faculty grant recipients and their students are working with more than 10 community partners in 15 countries and across the world at large. Faculty who receive grant awards are encouraged to participate in an ICC learning community, project development working sessions, and other workshops—provided in collaboration with the Center for Teaching Excellence, Cornell Abroad, Mario Einaudi Center for International Studies, Engaged Cornell, Language Resource Center, and other partners. Offered bi-annually by Cornell's Mario Einaudi Center for International Studies, Seed Grants and Small Grants for faculty promote research and curriculum development in international studies. Tenured and tenure-track Cornell faculty are eligible to apply for these grants, as are programs and centers within the university. Applications are due in September and March every year. The Mario Einaudi Center for International Studies maintains a searchable database of faculty funding opportunities for international research support. The database focuses on opportunities from national and international foundations in addition to opportunities from government agencies.